Celina Alvarez is the Executive Director of Housing Works, and public speaker on the issue of homelessness in Los Angeles. Gary Blasi is a Professor of Law Emeritus at UCLA. Named one of the top 100 lawyers in California in 2007, and recipient of the 2012 Humanitarian Award by the ACLU of Southern California, he focuses on legal and policy advocacy to end homelessness with an emphasis on veterans, and improving learning opportunities in substandard schools. Jerry Jones is the Director of Public Policy at the Inner City Law Center, and former Executive Director of the National Coalition for the Homeless. He currently serves as the Board President of Housing Works, and is a member of the Los Angeles Coalition to End Youth Homelessness. Mary Kirchen is the Founder and current Director of Development at Housing Works, an affordable housing nonprofit founded in 2003. Kirchen was a member of the leadership team and President of Immaculate Heart Community for six years. Steve Lopez is a journalist who has worked as a columnist for the Los Angeles Times since 2001. Previously, Lopez has been a part of the staff at Time Inc, Life, Entertainment Weekly and Sports Illustrated. He has published collections of columns titled Land of Giants and Dreams & Schemes. Alisa Orduna was the Homelessness Policy Director for Los Angeles Mayor Eric Garcetti at the time of filming, and currently serves the City of Santa Monica as a Senior Advisor on Homelessness. Mark Ridley-Thomas is the Los Angeles County Supervisor for the 2nd District, and holds a Ph.D in Social Ethics and Policy Analysis from the University of Southern California. He was first elected to the Los Angeles City Council in 1991. After serving as a California State Senator and Assemblyman, Ridley-Thomas was elected as a County Supervisor. David Ryu has been an LA City Council Member since 2015. Before being a council member in Los Angeles, he was a deputy to Los Angeles County Supervisor Yvonne Burke and a special investigator for Los Angeles County’s Auditor—Controller. Paul Tepper is the Executive Director of Western Center on Law & Poverty. He was formerly the Executive Director of the WCA Development Corporation and served on the Board of Directors of the California Bar Foundation. Tepper is an active member of the California bar with a J.D. from Washington University School of Law. Rob Zifchak is an On Site Service Case Manager with Housing Works. Zifchak works at the Teague Terrace location, where he provides direct support to individuals experiencing homelessness, along with mental health or addiction complications. 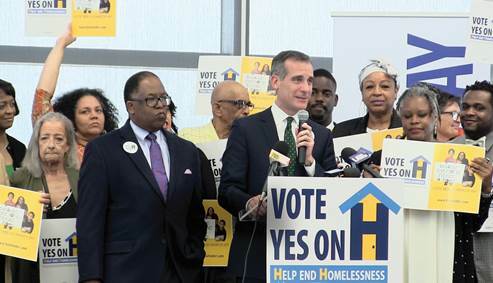 Los Angeles County Supervisor Mark Ridley-Thomas and Los Angeles Mayor Eric Garcetti announcing the passage of Measure H.